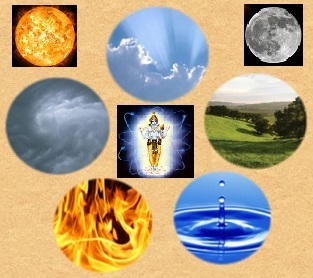 By using the terms vaiyam, vArkadal and kadhirOn, AzhwAr is referring to the elements earth, water and fire through analogy, thus implying all five elements. Through these five, he thinks of the entire constellation, narrowing to earth, its hardness, the tenderness of water, the heat of fire, and thinks of the entire leelA vibhUthi (material realm). By using the term sudarAzhiyAn (divine chakra – disc of emperumAn) he refers to nithyavibhUthi (spiritual realm) and through the term adikkE he refers to the divine feet of emperumAn, thus implying that emperumAn has a divine form and controls both the vibhUthis (realms). He also implies the SEshithvam (lordship) of emperumAn as well as his own SEshathvam (servitude), carrying out service to emperumAn through his divine feet. Since emperumAn is happy with his service, AzhwAr too feels happy for having gladdened emperumAn. He says that in order to remove the lowliness of not having carried out such kainkaryam (service to emperumAn) so far, he is adorning emperumAn’s divine feet [with his verses]. Another interpretation is that since he had not got the knowledge so far to do this, he wants emperumAn to remove the hurdle of samsAram which is the cause of his continued ignorance. vaiyam thagaLiyA – SrIvishNu purANam 1-14-28 says “kAtinyavAn yO pibharthi jagathEthadhaSEshatha: I SabdhAdhi samSrayO vyApI thasmai bhUmyAthmanE nama: II (salutations to the all pervading supreme entity who is in the form of earth with the five qualities of Sabdha etc (Sabdha, rUpa, rasa, gandha and sparSam, the five senses relating to sound, vision, taste, smell and touch respectively). Earth is a hard material and holds the world in it. Thus earth is considered as capable of holding [like a lamp] the substances which are mentioned as simile to ghee (clarified butter) and wick which are mentioned later in the pAsuram (hymn). Since the world has a form, like a lamp, it appears that it should have been created by an entity; it is being compared to the container (of lamp) to affirm the existence of supreme entity. veyya kadhirOn viLakkAga – sun is compared to the lamp (wick) since it has hot rays emanating from it and it is a radiant material. As thaiththiriya upanishath says “bhIshOdhEthi sUrya:” (sun rises because of his fear of emperumAn). He is seen for 30 nAzhigai (one nAzhigai is 24 minutes) and is not seen for the other 30 nAzhigai. He reveals emperumAn like a wick in a lamp. vaiyam thagaLiyA – Just as a log of wood floats in water, the earth is also floating. Should there not be a reason for it? vAr kadalE neyyAga – instead of inundating the earth, the ocean is limiting itself within its boundary. Should there not be a reason for it? veyya kadhirOn viLakkAga – without reducing or increasing from its 30 nAzhigai, sun rises and sets every day. Should there not be a reason for it? And, should not such an entity, which is the reason for all these, be omniscient and omnipotent? Once it is known that everything is his and he is the master of all, the hymn says what should be done further. seyya sudarAzhiyAn adikkE – nammAzhwAr, in periya thiruvandhAdhi 26 says “iruLanna mAmEni em iRaiyAr” (my Lord’s divine form has the colour of darkness). For such a dark form, the divine chakra (disc) adds a contrasting red colour. These words negate the opinions of other philosophies which say that brahmam (supreme entity) does not exist, or that it has weapons other than chakra or that it does not have any auspicious qualities etc. These words confirm that emperumAn has all the wealth, has divine weapons such as chakra, has a divine, beautiful form etc. The reddish colour of chakra contrasts well with the black colour of his divine form. Since AzhwArs were bestowed with unblemished knowledge, the first realisation that they get is that they are servitors and they should serve the divine feet of emperumAn. pirAtti (emperumAn’s consort, mahAlakshmi) holds emperumAn’s hands. AzhwAr is not pirAtti. Hence, he holds on to emperumAn’s divine feet. Under the divine feet of such an emperumAn…..
idarAzhi nInguga enRu – my ocean of sorrow, since it has not performed any kainkaryam, should leave me. I strung a garland of hymns for the samsAris, who do not know anything regarding emperumAn, and who are losing their svarUpam (basic nature), who, by learning this text which explains the truths about emperumAn, would have their ocean of sins, a container for all their sorrows, dry up. There is not a single meaning which has not been conveyed by this pAsuram [i.e., all the important meanings are present in this pAsuram itself]. We shall next take up the 2nd pAsuram. This entry was posted in iyaRpA, mudhal thiruvandhAdhi on June 7, 2017 by T N Krishnan.